The holidays are officially here. For a lot of us, that means plenty of plans are being made, preparations are underway, and holiday decorations are infusing homes with all kinds of festive flair. Of course, the holidays also mean that a season of merry gift-giving is before us. And while a lot of folks are fine going the traditional wrapping paper route, many others are seeking more creative alternatives. Perhaps you want to save some trees so you’re looking for a more sustainable option, or maybe you’re simply tired of the same ol’-same ol’ and want to spice things up a bit this year. Either way, the below alternatives to traditional wrapping paper are sure to inspire you to approach your gift-wrapping game from a whole new angle this year. Use kraft paper or regular brown paper bags as your base for this easy, customizable DIY! All you need is a big pink eraser to carve into the holiday symbol of your choice. Use that to stamp a pattern onto your paper and you've got extra-special gifts to place under the tree this year! This idea couldn’t be easier to execute or look prettier under the tree as shown by the Merriment blog. All you need are a few fabric swatches that fit your fancy and you’ll have some of the most attractive (and innovative) gifts around. Who knew that melted crayons could make such stunning gift wrap? Fortunately for us all, the design folks at Sisters What were well aware of the magic that can be made with this idea and are sharing it with the world. A paper bag, a few crayons featuring your favorite colors, and a free afternoon will leave you with the most creative presents out there. Turns out, your empty potato chip bags are bursting with gift-wrapping goodness and this blog is making it really easy to take advantage of. Next time you indulge in a bag of your favorite chips, save the bag and hit up this tutorial to apply this fresh idea. 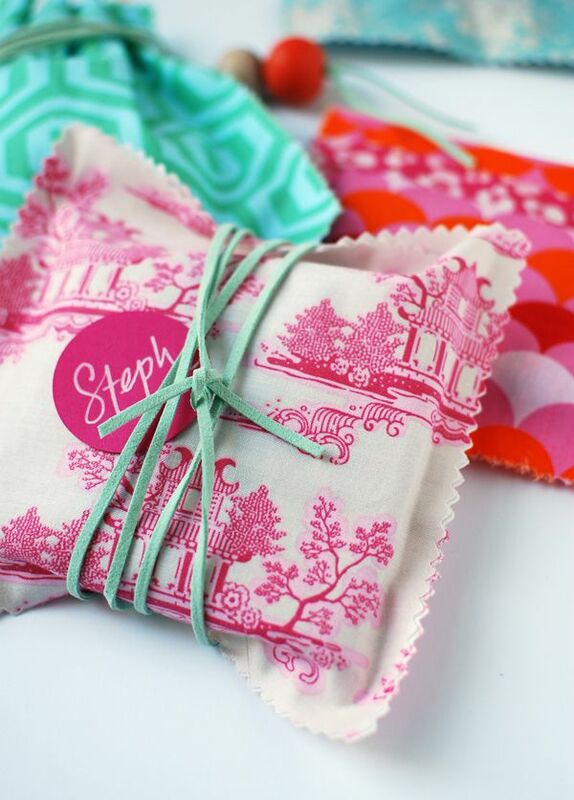 If the idea of making your own fabric bag scares you, don’t let it! This how-to will show you exactly how to make gorgeous, professional-looking fabric bags in a cinch—no needles required. Certainly we’re not the only ones enchanted by the looks of this sparkling idea. But the best part about it is that even the most DIY-challenged can capitalize on it. All it takes is a little glue, a little glitter, and a few minutes. If you’re in the mood to get creative and customized with your gift wrapping this season, then check out this printable chalkboard paper from Lia Griffith. Simply print and decorate with your favorite designs, and you’re good to go! This cute idea is perfect for those you want to send a special message to. Print a customized word search on paper and circle the messages you want to send that special someone. If you’re a craft enthusiast, then no doubt you have a ton of scrap paper piling up. Instead of throwing it out or leaving it to collect dust, make it into cute gift wrap with a few stamps and let this tutorial guide your way. Duct tape has come a long way from being all-silver, all-the-time. These days, it comes in an endless variety of colors and patterns that can instantly transform a bland wrapping job into an awesome one. Whether you’re pressed for time or you’re simply as in love with this idea as we are, using yarn patterns as gift decor is a super simple way to present striking gifts.